For the other virtual assistant from Google, see Google Now. "Google Duplex" redirects here. For the number, see googolduplex. Google Assistant is an artificial intelligence-powered virtual assistant developed by Google that is primarily available on mobile and smart home devices. Unlike the company's previous virtual assistant, Google Now, Google Assistant can engage in two-way conversations. Assistant initially debuted in May 2016 as part of Google's messaging app Allo, and its voice-activated speaker Google Home. After a period of exclusivity on the Pixel and Pixel XL smartphones, it began to be deployed on other Android devices in February 2017, including third-party smartphones and Android Wear (now Wear OS), and was released as a standalone app on the iOS operating system in May 2017. Alongside the announcement of a software development kit in April 2017, the Assistant has been, and is being, further extended to support a large variety of devices, including cars and third party smart home appliances. The functionality of the Assistant can also be enhanced by third-party developers. In 2017, Google Assistant was installed on more than 400 million devices. Users primarily interact with Google Assistant through natural voice, though keyboard input is also supported. In the same nature and manner as Google Now, the Assistant is able to search the Internet, schedule events and alarms, adjust hardware settings on the user's device, and show information from the user's Google account. Google has also announced that the Assistant will be able to identify objects and gather visual information through the device's camera, and support purchasing products and sending money, as well as identifying songs. 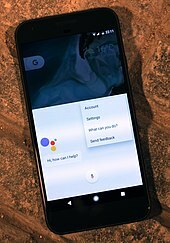 Google Assistant was unveiled during Google's developer conference on May 18, 2016, as part of the unveiling of the Google Home smart speaker and new messaging app Allo; Google CEO Sundar Pichai explained that the Assistant was designed to be a conversational and two-way experience, and "an ambient experience that extends across devices". Later that month, Google assigned Google Doodle leader Ryan Germick and hired former Pixar animator Emma Coats to develop "a little more of a personality." For system-level integration outside of the Allo app and Google Home, Google Assistant was initially exclusive to the Pixel and Pixel XL smartphones. In February 2017, Google announced that it had begun to enable access to the Assistant on Android smartphones running Android Marshmallow or Nougat, beginning in select English-speaking markets. Android tablets did not receive the Assistant as part of this rollout. The Assistant is also integrated in Android Wear 2.0, and will be included in future versions of Android TV and Android Auto. In October 2017, the Google Pixelbook became the first laptop to include Google Assistant. Google Assistant later came to the Google Pixel Buds. In December 2017, Google announced that the Assistant would be released for phones running Android Lollipop through an update to Google Play Services, as well as tablets running 6.0 Marshmallow and 7.0 Nougat. On May 15, 2017, Android Police reported that Google Assistant would be coming to the iOS operating system as a separate app. The information was confirmed two days later at Google's developer conference. In January 2018 at the Consumer Electronics Show, the first Assistant-powered "smart displays" were released. Smart displays were shown at the event from Lenovo, Sony, JBL and LG. These devices have support for Google Duo video calls, YouTube videos, Google Maps directions, a Google Calendar agenda, viewing of smart camera footage, in addition to services which work with Google Home devices. These devices are based on Android Things and Google-developed software. Google unveiled its own smart display, Google Home Hub, in October 2018, which utilizes a different system platform. In December 2016, Google launched "Actions on Google", a developer platform for Google Assistant. Actions on Google allows 3rd party developers to build apps for Google Assistant. In March 2017, Google added new tools for developing on Actions on Google to support the creation of games for Google Assistant. Originally limited to the Google Home smart speaker, Actions on Google was made available to Android and iOS devices in May 2017, at which time Google also introduced an app directory for overview of compatible products and services. To incentivize developers to build Actions, Google announced a competition, in which first place won tickets to Google's 2018 developer conference, $10,000, and a walk-through of Google's campus, while second place and third place received $7,500 and $5,000, respectively, and a Google Home. In April 2017, a software development kit (SDK) was released, allowing third-party developers to build their own hardware that can run Google Assistant. It has been integrated into Raspberry Pi, cars from Audi and Volvo, and smart home appliances, including fridges, washers, and ovens, from companies including iRobot, LG, General Electric, and D-Link. Google updated the SDK in December 2017 to add several features that only the Google Home smart speakers and Google Assistant smartphone apps had previously supported. allowing users to set a precise geographic location for the device to enable improved location-specific queries. On May 2, 2018, Google announced a new program on their blog that focuses on investing in the future of Google Assistant through early-stage startups. Their focus was to build an environment where developers could build richer experiences for their users. This includes startups that broaden Assistant's features, are building new hardware devices, or simply differentiating in different industries. Google Assistant, in the nature and manner of Google Now, can search the Internet, schedule events and alarms, adjust hardware settings on the user's device, and show information from the user's Google account. Unlike Google Now, however, the Assistant can engage in a two-way conversation, using Google's natural language processing algorithm. Search results are presented in a card format that users can tap to open the page. In February 2017, Google announced that users of Google Home would be able to shop entirely by voice for products through its Google Express shopping service, with products available from Whole Foods Market, Costco, Walgreens, PetSmart, and Bed Bath & Beyond at launch, and other retailers added in the following months as new partnerships were formed. Google Assistant can maintain a shopping list; this was previously done within the notetaking service Google Keep, but the feature was moved to Google Express and the Google Home app in April 2017, resulting in a severe loss of functionality. In May 2017, Google announced that the Assistant would support a keyboard for typed input and visual responses, support identifying objects and gather visual information through the device's camera, and support purchasing products and sending money. Through the use of the keyboard, users can see a history of queries made to Google Assistant, and edit or delete previous inputs. The Assistant warns against deleting, however, due to its use of previous inputs to generate better answers in the future. In November 2017, it became possible to identify songs currently playing by asking the Assistant..
Google Assistant allows users to activate and modify vocal shortcut commands in order to perform actions on their device (both Android and iPad/iPhone) or configuring it as a hub for home automation. This feature of the speech recognition is available in English, among other languages. In July 2018, the Google Home version of Assistant gained support for multiple actions triggered by a single vocal shortcut command. At the annual I/O developers conference on May 8, 2018, Google's SEO announced the addition of six new voice options for Google Assistant, one of which being John Legend's. This was made possible by WaveNet, a voice synthesizer developed by DeepMind, which significantly reduced the amount of audio samples that a voice actor was required to produce for creating a voice model. In August 2018, Google added bilingual capabilities to Google Assistant for existing supported languages on devices.Recent reports say that it may support multilingual support by setting a third default language on Android Phone. As a default option, Google Assistant doesn't support two common features of the speech recognition on the transcripted texts, like punctuation and spelling. However, a Beta feature of Speech-to-text enables only en-Us language users to ask "to detect and insert punctuation in transcription results. Speech-to-Text can recognize commas, question marks, and periods in transcription requests. This section is about Duplex for Google Assistant. For the number, see googolplex. In May 2018, Google revealed Duplex, an extension of Google Assistant that allows it to carry out natural conversations by mimicking human voice, in a manner not dissimilar to robocalling. The assistant can autonomously complete tasks such as calling a hair salon to book an appointment, scheduling a restaurant reservation, or calling businesses to verify holiday store hours. While Duplex can complete most of its tasks fully autonomously, it is able to recognize situations that it is unable to complete and can signal a human operator to finish the task. Duplex was created to speak in a more natural voice and language by incorporating speech disfluencies such as filler words like "hmm" and "uh" and using common phrases such as "mhm" and "gotcha", along with more human-like intonation and response latency. Duplex is currently in development and have a limited release in late 2018 with Google Pixel users. During the limited release, Pixel phone users in Atlanta, New York, Phoenix, and San Francisco were only able to use Duplex to make restaurant reservations. After the announcement, concerns were made over the ethical and societal questions that artificial intelligence technology such as Duplex raises. For instance, human operators may not notice that they are speaking with a digital robot when conversing with Duplex, which some critics view as unethical or deceitful. Concerns over privacy were also identified, as conversations with Duplex are recorded in order for the virtual assistant to analyze and respond. Privacy advocates have also raised concerns of how the millions of vocal samples gathered from consumers are fed back into the algorithms of virtual assistants, making these forms of AI smarter with each use. Though these features individualize the user experience, critics are unsure about the long term implications of giving "the company unprecedented access to human patterns and preferences that are crucial to the next phase of artificial intelligence", which could potentially lead to AI outsmarting its creators. While transparency was referred to as a key part to the experience when the technology was revealed, Google later further clarified in a statement saying, "We are designing this feature with disclosure built-in, and we'll make sure the system is appropriately identified." Google further added that, in certain jurisdictions, the assistant would inform those on the other end of the phone that the call is being recorded. PC World's Mark Hachman gave a favorable review of Google Assistant, saying that it was a "step up on Cortana and Siri." Digital Trends called it "smarter than Google Now ever was." ^ Narayanaswamy, Anand (December 6, 2017). "Jio Phone to reboot with Google Assistant special edition". NetAns. Retrieved December 20, 2018. ^ "Google Assistant on more than 400 million devices in 2017". PPC Land. January 5, 2018. Retrieved December 30, 2018. ^ a b Bohn, Dieter (January 8, 2018). "Google is introducing a new Smart Display platform". The Verge. Vox Media. Retrieved January 13, 2018. ^ Lynley, Matthew (May 18, 2016). "Google unveils Google Assistant, a virtual assistant that's a big upgrade to Google Now". TechCrunch. AOL. Retrieved March 17, 2017. ^ de Looper, Christian (May 31, 2016). "Google wants to make its next personal assistant more personable by giving it a childhood". Digital Trends. Retrieved March 17, 2017. ^ Savov, Vlad (October 4, 2016). "Pixel 'phone by Google' announced". The Verge. Vox Media. Retrieved March 17, 2017. ^ Bohn, Dieter (February 26, 2017). "The Google Assistant is coming to Marshmallow and Nougat Android phones starting this week". The Verge. Vox Media. Retrieved March 17, 2017. ^ Lunden, Ingrid (February 26, 2017). "Google Assistant, its AI-based personal helper, rolls out to Nougat and Marshmallow handsets". TechCrunch. AOL. Retrieved March 17, 2017. ^ El Khoury, Rita (March 16, 2017). "Google confirms wider Assistant rollout will not reach tablets". Android Police. Retrieved March 17, 2017. ^ Kastrenakes, Jacob (March 16, 2017). "Android tablets aren't getting Google Assistant anytime soon". The Verge. Vox Media. Retrieved March 17, 2017. ^ Amadeo, Ron (January 17, 2017). "Report: Android Wear 2.0 to launch February 9". Ars Technica. Condé Nast. Retrieved March 17, 2017. ^ Ingraham, Nathan (January 4, 2017). "The Google Assistant is coming to Android TV". Engadget. AOL. Retrieved March 17, 2017. ^ Singleton, Micah (May 17, 2017). "Google Assistant is coming to Android TV later this year". The Verge. Vox Media. Retrieved May 30, 2017. ^ Amadeo, Ron (February 26, 2017). "Google Assistant comes to every Android phone, 6.0 and up". Ars Technica. Condé Nast. Retrieved March 17, 2017. ^ Field, Matthew (October 4, 2017). "Google launches Pixelbook as first laptop with Google Assistant". The Daily Telegraph. Telegraph Media Group. Retrieved December 15, 2017. ^ Johnson, Khari (November 11, 2017). "Google Pixel Buds review: Google Assistant makes a home in your ears". VentureBeat. Retrieved December 10, 2017. ^ Lardinois, Frederic (December 13, 2017). "Google Assistant is coming to older Android phones and tablets". TechCrunch. Oath Inc. Retrieved December 13, 2017. ^ Ruddock, David (May 15, 2017). "Google will announce Assistant for iOS soon, in the US only at launch". Android Police. Retrieved May 30, 2017. ^ Dillet, Romain (May 17, 2017). "Google launches Google Assistant on the iPhone". TechCrunch. AOL. Retrieved May 17, 2017. ^ Baig, Edward (January 9, 2018). "Google Assistant is coming to smart screens, rivaling Amazon Echo Show". USA Today. Retrieved January 13, 2018 – via WBIR-TV. ^ Lee, Nicole (January 12, 2018). "CES showed us smart displays will be the new normal". Engadget. 13 January 2018. Retrieved January 13, 2018. ^ Miller, Paul (October 4, 2016). "Google Assistant will open up to developers in December with 'Actions on Google'". The Verge. Vox Media. Retrieved May 8, 2017. ^ Low, Cherlynn (December 8, 2016). "Google opens up its Assistant actions to developers". Engadget. AOL. Retrieved May 8, 2017. ^ Vemuri, Sunil (March 30, 2017). "Game developers rejoice—new tools for developing on Actions on Google". Google Developers Blog. Google. Retrieved May 8, 2017. ^ Bohn, Dieter (May 17, 2017). "Third-party actions will soon work on Google Assistant on the phone". The Verge. Vox Media. Retrieved May 30, 2017. ^ Perez, Sarah (May 17, 2017). "Google Actions expand to Android and iPhone". TechCrunch. AOL. Retrieved May 30, 2017. ^ Whitwam, Ryan (May 18, 2017). "Google Assistant gets an app directory with categories and sample commands". Android Police. Retrieved May 30, 2017. ^ Davenport, Corbin (May 29, 2017). "Google is offering up to $10,000 to developers making Google Assistant actions". Android Police. Retrieved June 1, 2017. ^ Amadeo, Ron (April 27, 2017). "The Google Assistant SDK will let you run the Assistant on anything". Ars Technica. Condé Nast. Retrieved April 28, 2017. ^ Bohn, Dieter (April 27, 2017). "Anybody can make a Google Assistant gadget with this new toolkit". The Verge. Vox Media. Retrieved April 28, 2017. ^ Gordon, Scott Adam (May 4, 2017). "Google voice control comes to the Raspberry Pi via new DIY kit". Android Authority. Retrieved May 8, 2017. ^ Vincent, James (May 4, 2017). "You can now use Google's AI to add voice commands to your Raspberry Pi". The Verge. Vox Media. Retrieved May 8, 2017. ^ Gurman, Mark; Bergen, Mark (May 15, 2017). "Google Wants Android and Its Assistant to Power Your Car Too". Bloomberg Technology. Bloomberg L.P. Retrieved May 17, 2017. ^ O'Kane, Sean (May 15, 2017). "Audi and Volvo will use Android as the operating system in upcoming cars". The Verge. Vox Media. Retrieved May 17, 2017. ^ El Khoury, Rita (May 18, 2017). "Google Assistant can now control more appliances and smart home devices including Roomba, LG, GE, and D-Link". Android Police. Retrieved May 30, 2017. ^ Kastrenakes, Jacob (May 17, 2017). "LG and GE add Google Assistant support to fridges, washers, ovens, and more". The Verge. Vox Media. Retrieved May 30, 2017. ^ Wollerton, Megan (May 17, 2017). "Google Assistant makes its way to your large home appliances". CNET. CBS Interactive. Retrieved May 30, 2017. ^ Gartenberg, Chaim (December 20, 2017). "Google's latest Assistant SDK updates make third-party speakers smarter". The Verge. Vox Media. Retrieved December 21, 2017. ^ Pelegrin, Williams (December 20, 2017). "Google Assistant SDK updated with new languages and features". Android Authority. Retrieved December 21, 2017. ^ Kapoor, Sanjay; Fox, Nick (May 2, 2018). "Investing in startups and the future of the Google Assistant". Google Blog. Retrieved February 12, 2019. ^ Purewal, Sarah Jacobsson (October 4, 2016). "The difference between Google Now and Google Assistant". CNET. CBS Interactive. Retrieved March 17, 2017. ^ Steele, Billy (February 16, 2017). "Google Assistant now helps with your shopping on Google Home (updated)". Engadget. Oath Inc. Retrieved December 10, 2017. ^ Martin, Taylor (February 16, 2017). "Google Home now lets you shop for everyday items with your voice". CNET. CBS Interactive. Retrieved December 10, 2017. ^ Ingraham, Nathan (September 25, 2017). "Order from Walmart by chatting with Google Home". Engadget. Verizon Media. Retrieved December 10, 2017. ^ D'innocenzio, Anne (October 12, 2017). "Target is joining forces with Google to take on Amazon". Business Insider. Axel Springer SE. Retrieved December 10, 2017. ^ Amadeo, Ron (April 11, 2017). "Google ruins the Assistant's shopping list, turns it into a big Google Express ad". Ars Technica. Condé Nast. Retrieved May 30, 2017. ^ Garun, Natt (April 10, 2017). "Google Assistant's shopping lists are moving to the Home app today". The Verge. Vox Media. Retrieved May 30, 2017. ^ Bohn, Dieter (May 17, 2017). "You can finally use the keyboard to ask Google Assistant questions". The Verge. Vox Media. Retrieved May 30, 2017. ^ LeFebvre, Rob (May 17, 2017). "Google Assistant now accepts typed and verbal cues". Engadget. AOL. Retrieved May 30, 2017. ^ Welch, Chris (May 17, 2017). "Google Assistant will soon search by sight with your smartphone camera". The Verge. Vox Media. Retrieved May 30, 2017. ^ Conditt, Jessica (May 17, 2017). "Google Lens is a powerful, AI-driven visual search app". Engadget. AOL. Retrieved May 30, 2017. ^ Garun, Natt (May 17, 2017). "You can buy stuff with Google Assistant now". The Verge. Vox Media. Retrieved May 30, 2017. ^ Solsman, Joan E. (May 17, 2017). "Google Assistant wants to make buying stuff easier. Just ask it". CNET. CBS Interactive. Retrieved May 30, 2017. ^ Scrivens, Scott (May 18, 2017). "Google Assistant will soon support sending money with your Google account". Android Police. Retrieved May 30, 2017. ^ Miller, Paul (May 18, 2017). "You'll soon be able to send money with Google Assistant". The Verge. Vox Media. Retrieved May 30, 2017. ^ Whitwam, Ryan (May 18, 2017). "Google Assistant on Android now has query history that you can edit or delete". Android Police. Retrieved May 30, 2017. ^ Liao, Shannon (November 6, 2017). "Google Assistant can now tell you what song is playing near you". The Verge. Vox Media. Retrieved December 10, 2017. ^ Li, Abner (November 6, 2017). "Google Assistant can finally recognize music and songs, rolling out now". 9to5Google. Retrieved December 10, 2017. ^ "Create shortcut commands". supports.google.com. Archived from the original on October 12, 2018. Retrieved October 12, 2018. ^ Murnane, Kevin (May 23, 2017). "How To Set Up Google Assistant's Little-Known And Super-Useful Shortcuts". Forbes. Archived from the original on October 12, 2018. Retrieved December 20, 2018. ^ Whitwam, Ryan (July 3, 2018). "Google Assistant: Awesome features you need to start using. Trigger multiple commands". PC World.com. Archived from the original on April 5, 2018. Retrieved October 12, 2018. ^ Tarantola, Andrew (May 8, 2018). "John Legend is one of six new Google Assistant voices". Engadget. Retrieved May 9, 2018. ^ Martin, Taylor (May 9, 2018). "Try the all-new Google Assistant voices right now". CNET. Retrieved May 10, 2018. ^ Lardinois, Frederic (30 August 2018). "The Google Assistant is now bilingual". TechCrunch. Retrieved 20 December 2018. ^ "Getting Punctuation on Speech-to-Text". supports.google.com. Archived from the original on June 24, 2018. Retrieved October 12, 2018. ^ "Google Duplex: An AI System for Accomplishing Real-World Tasks Over the Phone". Google AI Blog. Retrieved October 15, 2018. ^ Nieva, Richard (May 9, 2018). "Google Assistant's one step closer to passing the Turing test". CNET. Retrieved May 10, 2018. ^ Leviathan, Yaniv; Matias, Yossi (May 8, 2018). "Google Duplex: An AI System for Accomplishing Real-World Tasks Over the Phone". Google AI Blog. Retrieved May 10, 2018. ^ Carey, Bridget (May 9, 2018). "Human or bot? Google Duplex scares me". CNET. Retrieved May 10, 2018. ^ Bergen, Mark (May 10, 2018). "Google Grapples With 'Horrifying' Reaction to Uncanny AI Tech". Bloomberg. Retrieved December 20, 2018. ^ Welch, Chris (May 8, 2018). "Google just gave a stunning demo of Assistant making an actual phone call". The Verge. Retrieved May 20, 2018. ^ Simonite, Tom (October 9, 2018). "Google Duplex, the Human-Sounding Phone Bot, Comes to the Pixel". Wired. Retrieved October 10, 2018. ^ Low, Cherlynn (May 11, 2018). "Google's AI advances are equal parts worry and wonder". Engadget. Retrieved May 14, 2018. ^ Gershgorn, Dave (May 12, 2018). "It's Google's turn to ask the questions". Quartz. Retrieved May 14, 2018. ^ a b Vomiero, Jessica (May 12, 2018). "Google's AI assistant must identify itself as a robot during phone calls: report". Global News. Retrieved May 14, 2018. ^ Jeong, Sarah (May 11, 2018). "No one knows how Google Duplex will work with eavesdropping laws". The Verge. Retrieved May 14, 2018. ^ Lulwani, Mona (October 5, 2016). "Personal Assistants are Ushering in the Age of AI at home". Engadget. Retrieved May 30, 2018. ^ "Google now says controversial AI voice calling system will identify itself to humans". The Verge. Retrieved May 14, 2018. ^ Bergen, Mark (May 18, 2018). "Google's Duplex AI Robot Will Warn That Calls Are Recorded". Bloomberg.com. Retrieved May 20, 2018. ^ Hachman, Mark (September 22, 2016). "Hands-on: Google Assistant's Allo chatbot outdoes Cortana, Siri as your digital pal". PC World. International Data Group. Retrieved March 17, 2017. ^ "Google Assistant: Everything You Need To Know About The A.I." Digital Trends. July 17, 2018. Retrieved October 12, 2018.